Stellar Fundraising Auctions has partnered with copy writer Chaia Milstein to launch our new catalog copywriting service. Any fundraising auction team looking for clean, crisp, well-researched catalog descriptions of their live auction items can now get Stellar copy delivered on time and on budget. Some solicitation teams love to write the descriptions for all of the auction lots they have worked so hard to acquire, and we totally get it. We say more power to you! But sometimes, the act of getting the lots is enough – you still have to line up potential bidders, let alone plan the rest of the event – and writing each of the catalog descriptions is just one thing too many. Stellar can provide professional copy for all of your live auction items. We thoroughly research each auction lot, seeking the hidden “sizzle” that will engage potential buyers, and assure your donors you are handling their donation with aplomb. We thoroughly understand the intricacies of the planning process, and will work with your team to establish a timeline that works with your needs. Bringing in a successful auction is enough work, let us make it sound great for you! For more information about our Catalog Copy Writing Service, or to request a quote for services, please contact us here. Whether you are an existing Stellar client, or simply looking for help with your catalog, we'd love to chat with you. Raffles are an important revenue generator for most fundraising events. They provide a low-cost entry point for attendees to participate while simultaneously helping raise significant amounts. We consistently see raffles that raise $5,000 - $10,000 and occasionally see them in the $15,000 - $25,000 range. Most people think the prize is the most important piece of a raffle and focus all of their attention on finding something they think will have universal appeal. While the prize is important, I argue that the number of tickets you are going to make available is even more crucial. Gamblers like to know the odds before they put down their money. When you limit the number of available tickets for a raffle, you are giving people a clear understanding of their odds. And a perceived “good chance” encourages people to pay a higher price to play. Unlimited $25 raffle tickets aren’t as appealing – from a gambling standpoint – as 1 of 100 tickets at $50 each. Who knows how many people are going to buy one of those $25 tickets? But the $50 ticket? There are only 100 of those, and odds resonate with gamblers. By limiting supply you also enable your staff or volunteers to create a sense of urgency: “Do you want a 1 in 100 chance to win this trip to Hawaii? There are only 50 chances left…” Tickets will run out. Buy yours now. For a limited time only. There are a number of calculations that go into deciding how many tickets you should make available for a particular raffle and how much you should charge per ticket. First and foremost, you need to determine how much you want to raise in your raffle. Our recommendation is that any raffle should raise at least double the value of the donation. Then you have to calculate how many tickets you think you could sell. If you’ve never done a raffle before and have no data to rely on, just know that you can’t expect 100% of your attendees to buy raffle tickets. Between 15% and 20% of your attendees is a reasonable assumption, if the raffle is compelling. It is always preferable to have more demand than supply, so people will rush to get their tickets next year. Limit the number of tickets and increase the amount you raise in your raffle. People who participate in raffles are gamblers, and every gambler likes to think they are getting good odds. For years, one of our recommended strategies for a successful fund-a-need has been to begin asking for pledges at the highest level with a lead donor lined-up in advance. In other words, start asking for money at a level you know will be immediately successful. Even the most impromptu moments are the result of tons of planning, and your fund-a-need is no different. We had a lot of rationalizations for this: It forces events to have important conversations with donors pre-event; it pre-determines whether or not key supporters believe in what you’re asking them to help fund; and the night-of the event, it ensures that the fund-a-need starts off with immediate momentum. In the past few years, however, we’ve had some phenomenal successes starting the fund-a-need “out on a limb,” at a higher level than our lead donor commitment. At one event we had a $10,000 donor identified in advance, but we went out on a limb and another donor offered to pledge $100,000. He was followed by two more donors at $100,000, including a woman who was completely new to the organization. We’ve also had some abysmal failures, which are difficult to recover from. At a recent event, I was sent out on a limb at $50,000 and told to ask for $25,000 next. We received zero pledges at those two levels, killing most of the momentum the testimonial had generated. We have, therefore, identified four keys that will determine whether going out on a limb in the fund-a-need is appropriate for your event. 1) Can you justify starting higher? It seems like a silly question to ask, but do you need more money? If so, you need to be able to tell that story the night of your event in a way that empowers people to support you at a higher level. If you are going to send your auctioneer out on a limb, make sure you have tied that limb to the change you are asking people to fund. Example: You normally start your fund-a-need at $5,000 but this year you’d like to ask for $10,000. Prepare some examples of what $10,000 will help you do and utilize them as a reason for asking for more money. 2) Determine if your existing lead donor(s) will be upset by you asking for more than they agreed to pledge. Sometimes ego comes into play with high-dollar donors. I’ve seen instances where lead donors felt slighted because they thought they were going to be the top dog in the fund-a-need, and then we asked for more. 3) If you go out on a limb at a specific amount, make sure you have a *guaranteed* donor committed at the next level down. A fund-a-need that starts off with no pledges at one level can recover quickly if there is an immediate pledge at the next level down. Two levels of zero pledges can have a significantly negative impact on the momentum of your appeal and the amount you raise. 4) Do you have donors in the room who have the capacity to support you at a higher level? The $100,000 example above was set into motion the previous year, when a donor came to us after the event and assured us we had started the fund-a-need too low. He was right, as he was one of the donors who stepped up at $100,000. You may not know all of the donors in your room and may not know the individual capacity of all of them, but you should have a good sense of the potential capacity – or at least know someone who does. When in doubt, ask your supporters – your table captains or board members – for a reality check. You may have untapped potential in your crowd, and you’ll never know if you never ask. Let a previous winner sell the lot for you! One of the ways to generate excitement for a recurring auction lot at your event is to have a live testimonial from someone who won it previously as a part of the lot description. Last year I was reminded of how powerful a well-placed testimonial can be. The organization for whom I was working was auctioning off an African Safari that promised to be a challenging lot for several reasons. First, it was a high-dollar trip that did not include any of the travel between the U.S. and the wilderness reserve in Africa. Second, it was a consignment, meaning that while it could be doubled, it had a substantial reserve price. If it sold for just over than the reserve, the organization would make very little money. And third, it was through a company that, while highly rated, did only consignments for benefit and fundraising auctions, meaning that the winning bidder’s fellow guests on the safari all paid wildly differing prices for the exact same trip. Challenges notwithstanding, we decided to try to sell it in the live auction. During the reception that preceded the live program, the auction chair told me she wanted me to meet somebody. He was a guest at the gala who had won the same trip at an auction for a different organization the previous year and had already gone on the safari with his spouse. We chatted about his experience, and his review was glowing and heartfelt -- so much so that I asked him if he would say a few words about the trip before we sold that lot. He agreed. As he spoke I could see the crowd becoming more animated and excited. The bidding action was strong right out of the gate, and we ended up selling it for over twice the reserve and doubled the lot as well. And the credit for the success of that lot goes to the gentleman who shared his actual experience, making the trip much more attractive and accessible to the audience. That lot benefitted greatly from his testimonial – a real, human moment and a great reminder of why an organization has a live event in the first place. Not everyone is amenable to, or necessarily good at, talking about their experience in front of a crowd. But if there is a previous winner of a lot at your event, and they have a positive story to tell about it, it’s a resource worth exploring. Wine is consistently one of the top-selling categories of auction lots in fundraising auctions, and the vast majority of charity auctions we conduct feature at least one or two “wine lots.” People like their wine and are often more than willing to overpay for it in support of a good cause. But not every committee is comprised of wine lovers with expansive wine cellars, and sometimes coming up with a good wine lot is a daunting challenge. Committee members often don’t have the wines and don’t know which wines they should purchase to donate. Every year Wine Spectator releases its list of the top 100 wines of the year. 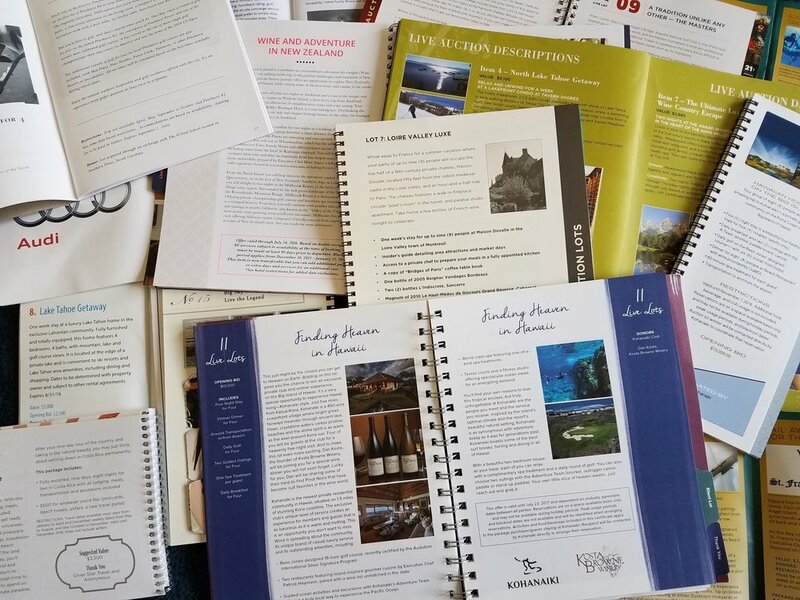 It isn’t simply a list of the 100 highest scoring wines from the previous year; the editors of Wine Spectator base their list on “quality, value, availability and excitement.” All important criteria when assembling an auction lot! Wine is perennially popular, especially wine with provenance. What this means is the wines on the Wine Spectator Top 100 are readily available and relatively affordable. Thirteen of the top twenty wines on the list have a retail value of $50 or less. Only eight of the entire list cost $100 or more. I recommend creating a lot of at least ten bottles. “Ten of the Wine Spectator’s Top 100 Wines” has a nice ring to it and is an achievable goal for most committees. Avoid duplication by agreeing as a group which wines you’ll be targeting individually. This ensures people have a clear direction and clearly defines the goals of the lot. Here’s a dirty little secret: although it is nice to target the top ten wines on the Wine Spectator list, you really don’t have to have all wines from the top of the list. Wines from anywhere in the top 100 will work – as long as a few of them sniff the rarified air of the top of the list. From a bidder’s perspective, the fact that someone else has pre-assembled a group of highly qualified wines makes this lot appealing. If the retail value is relatively low it, great! That gives people the opportunity to earn a higher tax deduction if they pay over value. And the many times I’ve sold variations of this lot, the final sale price has outperformed retail value. Have a favorite go-to wine lot for your fundraising auction? Let us know in the comments below!